1. This has caused an enormous amount of stress on the student body. Anyone not anticipating that doesn’t understand the teen population, as suicide is the #2 cause of death among 15-24 year olds (National Institute of Mental Health). Anyone failing to believe that students are stressed (in whatever forms) in this environment, either have no teens or aren’t paying attention to them. This is a great time to be proactive rather than reactive and demand appropriate action before we have a reason to mourn another teen suicide. 2. Another Manual employee is facing allegations that occurred outside the school & outside this state. Mr. Mayes sent an email to parents in the interest of “transparency.” Per the email, the employee was removed to ensure the “safety” of students until the matter was resolved. Mr. Mayes is on tape making inappropriate comments to students in his office with no other adults present & he admitted to making the statements. Yet, he remains at the school. What is different between that employee & Mr. Mayes? 4. Mr. Mayes is correct. It is the students’ perspective just as it was his. Everyone has a perspective and they should all be respected. Everyone is free to have their own perspective. No one is free to mistreat, intimidate, etc. others because they have different perspectives. 5. Every one deserves to be treated with the same God-given dignity & respect no matter what! We are all made in His image & did nothing to earn dignity & respect. No one has to earn dignity & respect from us no matter who they are, what they look like or how they identify themselves. 6. Perpetrators (especially those in power) know exactly how to make it difficult for victims to raise charges against them. This setting was perfect. 7. People all over the world are being congratulated and awarded for standing against social injustice. Most notably, at the moment, are sexual assault victims in this country. 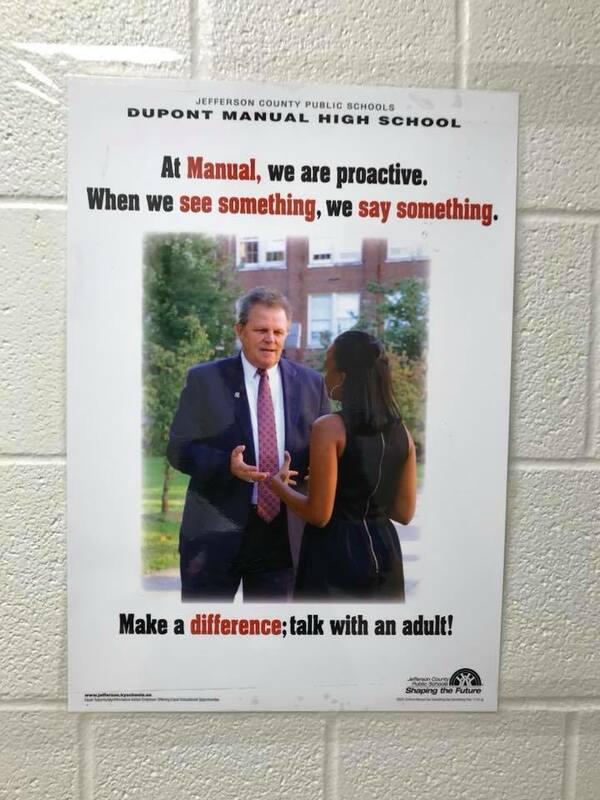 Somehow, though, for the students at a high school here in Louisville, KY, it’s a problem. 8. This sign is at school. The students followed it and are suffering because they actually trusted the message, but are receiving tons of criticism. The views expressed here are those of the author. If you or someone you know has a concern regarding events taking place at Manual or another JCPS school, you are encouraged to submit a letter using our open letter form. While the full name of the author has been withheld here, they are not anonymous to us. If a school board member would like to follow up on this complaint, they can contact us to make a connection with the author.